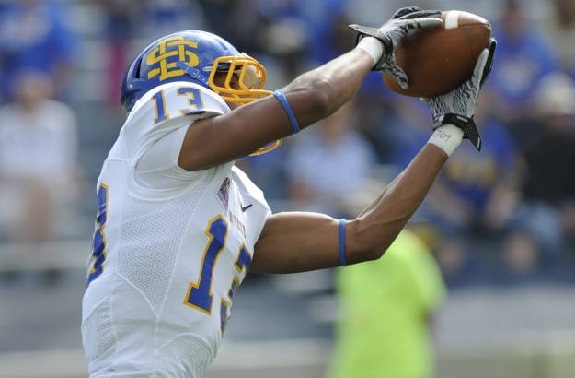 This week, I caught up with former South Dakota State wide receiver Dale Moss, who signed as a free agent with the Green Bay Packers following the draft. Here's how the interview went. A: My parents signed me up in the 3rd grade. Q: What is your biggest accomplishment in sports to this point? Q: What is your ultimate goal in the NFL? A: To eventually become a Pro Bowl wide receiver. A: Be hungry, but stay humble. Q: Do you have a saying or motto that you live your life by? A: The things you work the hardest for are the things you appreciate the most. Q: You played basketball at South Dakota State as well. When did switch to football? A: I actually played basketball all 4 years, and joined the football team my sophomore year. Q: Do you miss your basketball days, and were you the best basketball player on the football team? A: I miss basketball, but love the position I'm in now. And yes, I was the top hooper on the football team. Q: What is your favorite sports moment? A: I'd say Senior Day during football season. It was my last time playing in front of a SDSU crowd. Q: Is there a past or present NFL player that you study to try and improve your game? A: I take a little from several different players. Q: If you had to give advice to a young football player, what would it be? A: You can never be too prepared. Its cool he granted you an interview, but if any players answer to No. 3 is anything BUT win a Super Bowl, he's a selfish player. It probably won't matter though. As deep as Green Bay is at receiver, this guy probably isn't making the team. I wouldnt say they're deep at receiver, they have 2 solid guys and 1 that has great potential. Brian They asked for a personal goal not a team goal. If they said what is a goal you have for the packers he would have answered win a SuperBowl. I know him personally and he is the exact opposite of selfish. I just think it's cool in general that guys have been agreeing to do interviews. They're a nice edition to the site.